I really used to love doing the winged eyeliner on me but most of the time I ended up with a mess. Then I started experimenting and practicing whenever I got time to achieve the perfect look. And VOILA!! I was successful. So, here I am with a, Almost-Perfect Picture Tutorial and I am sure you cannot go wrong with it. Black or colored eyeliner (if you like) of any kind ~ liquid, gel, pencil, felt-tip. Here I used The Maybelline Hypersharp Liner. I started out with clean eyes. Apply a really thin eyeliner close to your upper lashline. You can skip this step if you want.If your eyelids are prone to getting oily, powder your lids first. From the very end of your upper lashline, make a thin line extending upward, towards where your eyebrows end. You can adjust the length according to your preference but keep in mind not to exceed beyond the end of your eyebrows. Now, close the eye you're applying liner to (I will tell you why later)*. 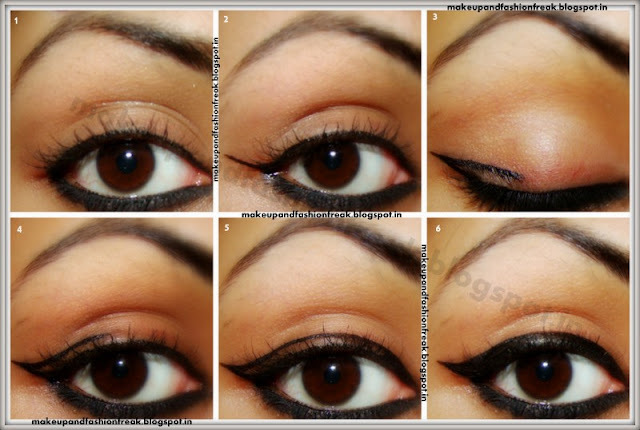 Starting from the top of the wing, draw a straight diagonal line ending at the middle of your lid. Try to make the line as straight as possible as if you were holding a ruler :P.
This is how it looks when you open your eyes. Finally fill in the gap between. Later tightline your eyes. And apply kajal to the lower lashline (optional). This is how I did my other eye. *Now, the reason I asked you to close your eyes while making a diagonal line inwards and to keep it open while joining it to the inner corner is ~ I want the liner to look really neat ~ curvy when you open your eyes and what do you call in the picture below :P when you close your eyes. Hope this helps. Do let me know if this tutorial works for you.